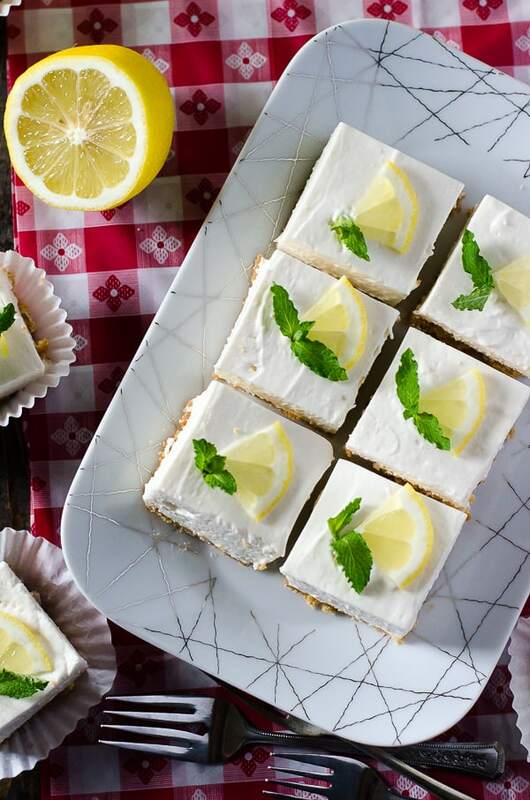 Light, fluffy, and totally refreshing, Nana’s No Bake Cheesecake Squares are a knockout ending to a steamy summer barbecue or picnic! Make a double batch to share at your next pool party! I often wonder what my children and grandchildren will remember me for. My Nana was my everything, but her biggest claim to fame was being the most badass baker and cook I knew. I could always count on her to have some tasty treat ready after dinner, or to take to school to share with my class for a special occasion. I used to daydream about all the wonderful creations I’d bake up for my kiddos to show off with. I was sure by then, 1/4 of the kids in the class will have food blogger moms (or dads)…but I’d still have the best cupcakes in town. Now that schools have taken that away from parents, forcing them to opt for store-bought sweets, how am I supposed to show off my own baking prowess? 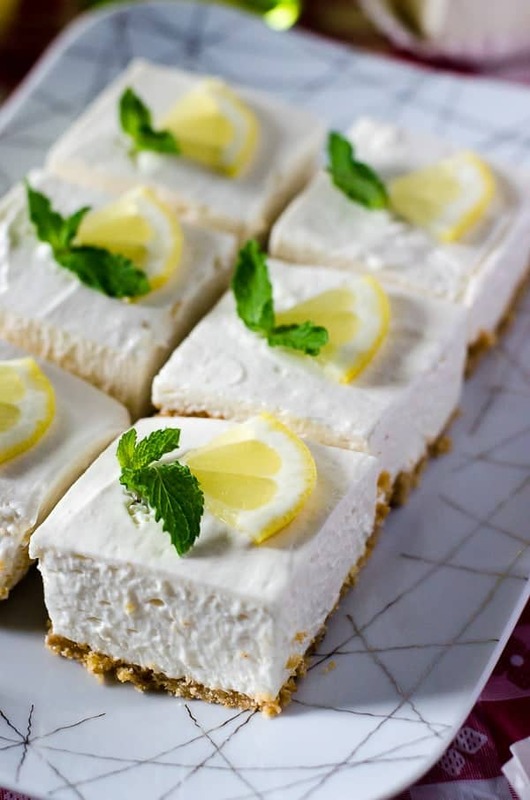 JUST TAKE ME TO THE NO BAKE CHEESECAKE SQUARES ALREADY! 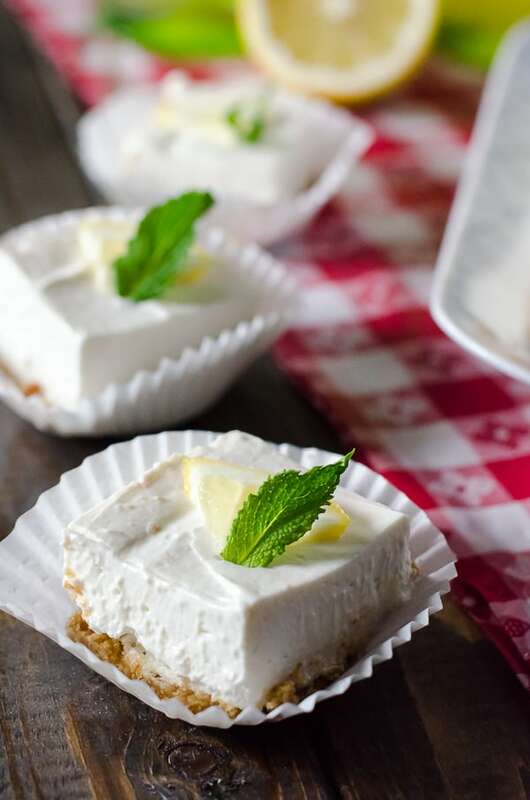 If you’d rather skip my (pretty darn helpful) tips and tricks, essential cooking info, and similar recipe ideas – and get straight to this deliciously easy no bake cheesecake recipe, just scroll right on down to the bottom of the page where you can find the printable recipe card! No, don’t get excited…I have nothing to report on the pregnancy horizon, yet. Sunday Supper’s just get me thinking, especially when the theme is based around nostalgia. Nostalgic summer recipes to be precise since tomorrow is the official first day of my least fave season of all. To most of the country (and likely the world) it means a nice warm break from harsh weather and a chance to get some color. For Floridians like me, displaced on principle (I’m nearly translucent and fry like a side of bacon) if not by birth, it’s a call to snuggle under a pile of blankets in 60-degree air conditioning to avoid ironically freezing to death while the outside temperature soars above 100. Rejoice in your electric bills, non-Floridians. The summertime ones hurt a little more every month. Especially if you live with MY husband, who’s Dominican blood apparently runs hotter than fresh flowing lava and desperately needs the house to be cold at all times. It’s a good thing I have a fuzzy sock and blanket obsession. Anyway, back on topic. Nostalgia! These incredible cheesecake squares come straight from Nana’s Cookbook and are one of my all-time favorite desserts. She had a habit of making sweets for no good reason, and this was her go-to cheesecake all year long. For me, it always tasted better in the summer. 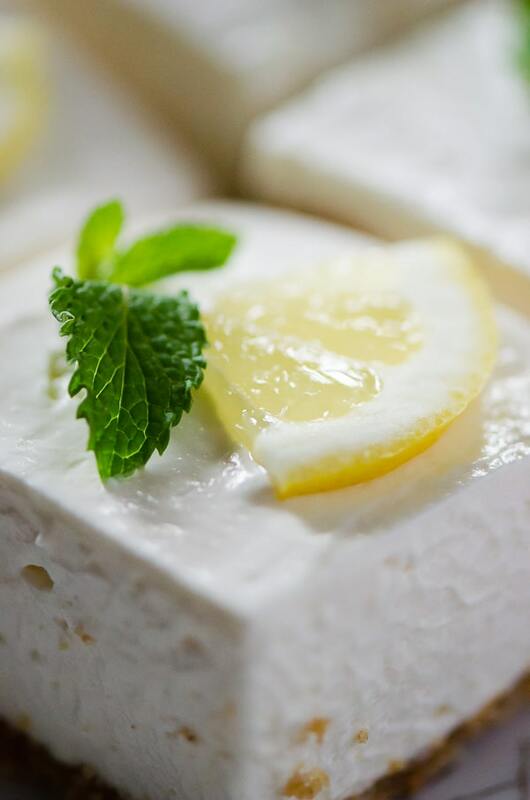 I’m a straight sucker for cheesecake of all kinds, but this one is so much different from your famous New York and French styles. For starters, there’s only one package of cream cheese used, which I promise is not a bad thing. It’s beaten until it’s creamy and soft, then mixed with sugar and salt, milk, vanilla, lemon juice, and loads of whipped cream. Now, you can use homemade whipped cream, and that’s all well and good and delicious. 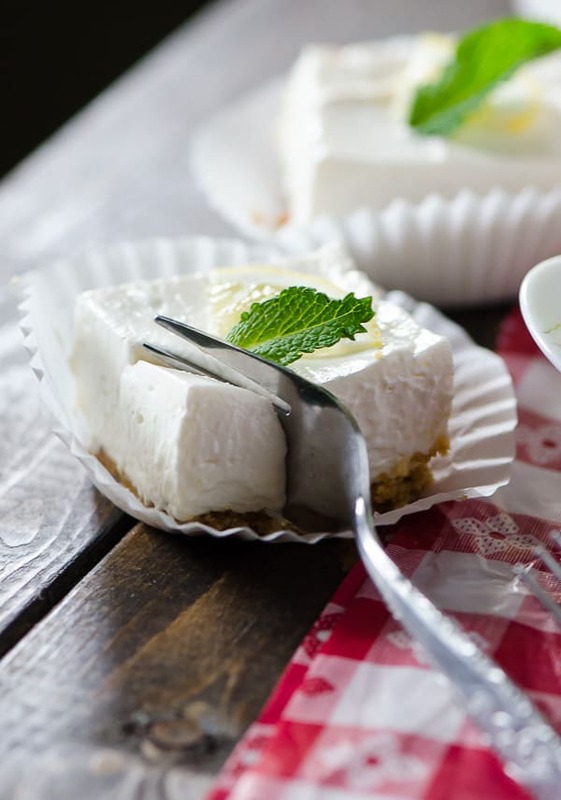 I use fresh whipped cream regularly, but in this cheesecake…I just have to default to the way Nana made it – with a tub of store-bought Cool Whip. It’s so easy, and the flavor just isn’t the same without it. I will say that the title is a bit of a lie, but only if you make it that way. The cheesecake itself is a true no-bake, but in Nana’s recipe, the crust does indeed get baked for 8-10 minutes. Of course, you can always chill the crust in the fridge for an hour before you fill it with cheesy goodness if you absolutely refuse to turn your kitchen temp up by using the oven. The final product will still be incredible. It’s fluffy and cool and it honestly just melts in your mouth. And the crust? So simple but SO GOOD. One square probably won’t be enough. Just sayin’. 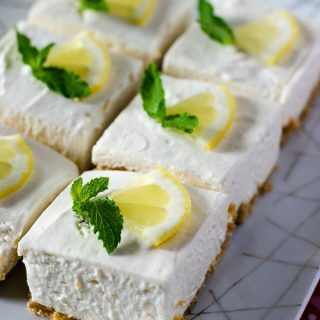 Baker’s note: I highly recommend garnishing these squares simply, with crumbled crust, or a lemon slice and perhaps a spring of mint for color as I did. Save the heavy fruit toppings and sauces for a heavy cheesecake – this one doesn’t need anything extra! 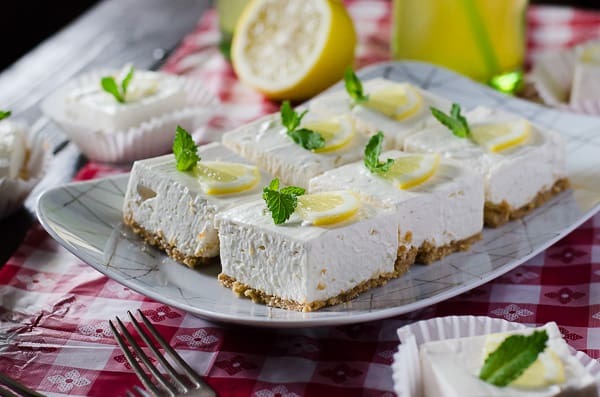 Light, fluffy, and totally refreshing, Nana’s No-Bake Cheesecake Squares are a knockout ending to a steamy summer barbecue or picnic! Make a double batch to share at your next pool party! If baking the crust, preheat oven to 375 degrees F. Line an 8x8 baking pan with aluminum foil; lightly butter (or use cooking spray) the bottom and sides. Set aside. Combine crumbs and 3 Tablespoons sugar in a medium bowl. Add butter and mix well, until clumps start to form. Press crumbs firmly on bottom and up sides of prepared pan. Either bake for 8-10 minutes and cool completely, or chill in the refrigerator for at least an hour before filling. 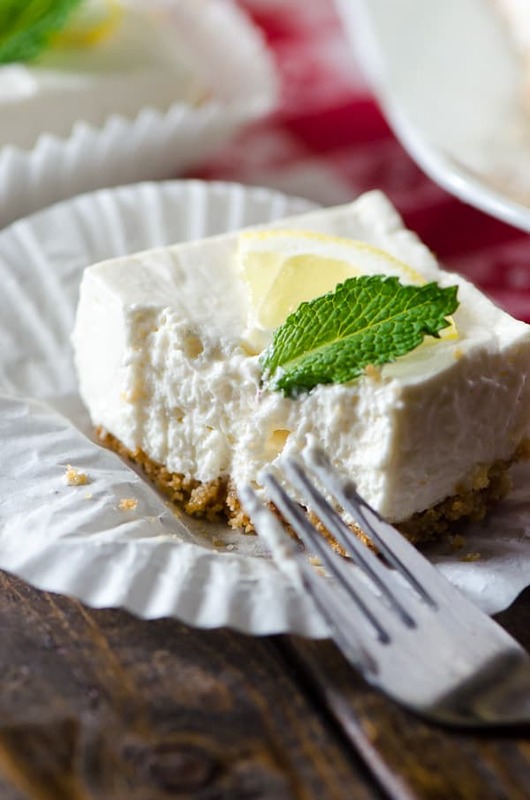 To make the cheesecake filling, beat cream cheese in a large bowl on high until smooth and fluffy. Add remaining sugar in gradually, beating constantly. Blend in salt, milk, lemon juice, and vanilla, beating until well combined. Fold in whipped cream, or blend in on low speed until fully combined. Spoon filling into cooled crust and spread evenly. Refrigerate 3-4 hours until set. Cut into squares. 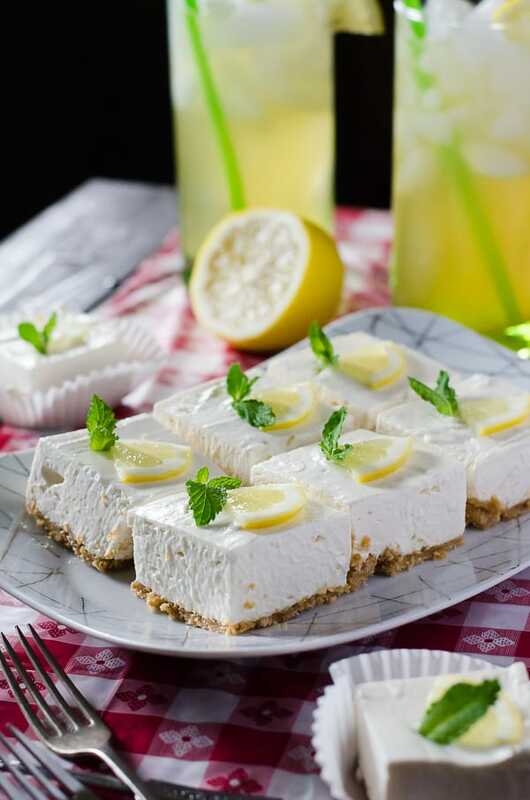 Garnish with quartered lemon slice and mint leaf, serve, and enjoy! Take a walk down memory lane this summer with the forever young kids of #SundaySupper! Oh my word – can I have a slice? or three? What a great post. I so enjoyed reading it. Your pictures are fantastic. I loved looking at the bright white little squares with the tack sharp mint leaf. Perfect. My grandma was my hero in the kitchen too, right down to the Ritz crackers with peanut butter and jelly. She indulged me and I gorged myself. My mother never would have let me eat those. These look like summer on a platter (which by the way I love your platter!) But more than anything I love these cheesecake squares! YUM! Love how easy these are! Perfect for summer. Beautiful photos Erica! these bars want to jump off the screen (and into my mouth of course)! Oh, man, do these thick cheesecake bars look scrumptious! Don’t worry, your children’s friends will come to play and they’ll learn that you have the best homemade sweets in town! P.S. My skin is white as a ghost. Once in college, one of my roomies asked if I was wearing my nursing hose. NOPE, they were my bare legs! I made cream cheese squares following your recipe. It looked perfect till I added milk. Then i thought may be after whipped cream it will settle. Whipped cream was perfectly whipped and then folded in cream cheese but it all became thick runny paste. Anyway I poured all of it in the pan with crumbs and left it in refrigerator and then in freezer. Before serving I cut it into squares and noticed that its melting. So much so that I had to put it back in freezer for a while before serving. They were more like ice cream…not soft and cheesy … :(… where did i go wrong…. and can you please upload step by step pics of recipe because that will be a great help.